A wreath on your door is the best first impression you can give to your visitors this Christmas! And saying welcome with gorgeous flowers is always the right thing to do. This week you’ll find everything you need to make a bang on trend modern minimal wreath. It’s easy! Simply gather bundles of botanicals, and wire them onto your steel ring. Wreaths not your thing? No worries! This week’s eclectic natives will look fab and festive simply popped into a vase at your front door to welcome you home. Pincushions – Native to the forests and mountain slopes of South Africa (although yours are grown locally!) these hardy blooms last ages and come in a range of fire-y colours. 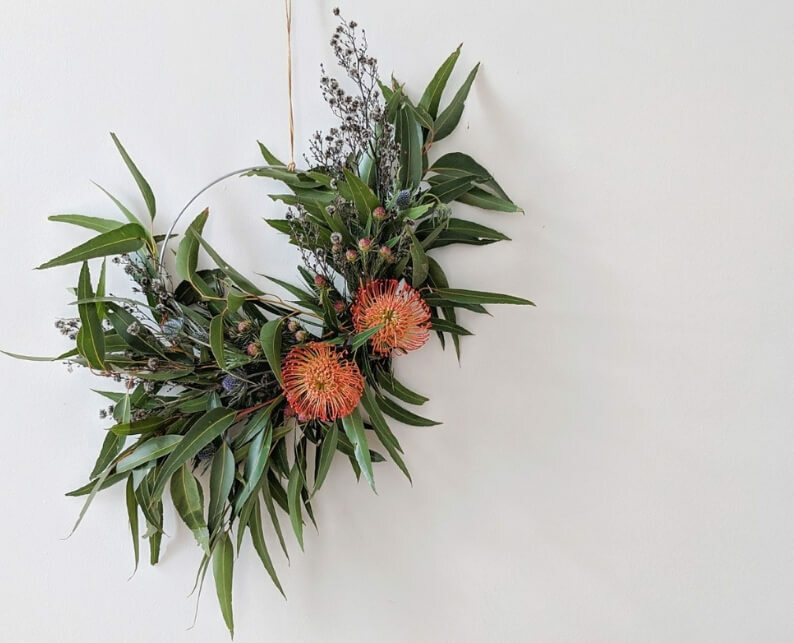 If you are making a wreath this week, you may need to cut the stems quite short to keep the flower heads facing forwards. Stirlingia – Fluffy “bobble” like flowers top the long slender stems of this West Australian native flower that’s usually harvested from the bush. Its snowball-esque blooms give a delicate Christmassy twist, and dry perfectly. 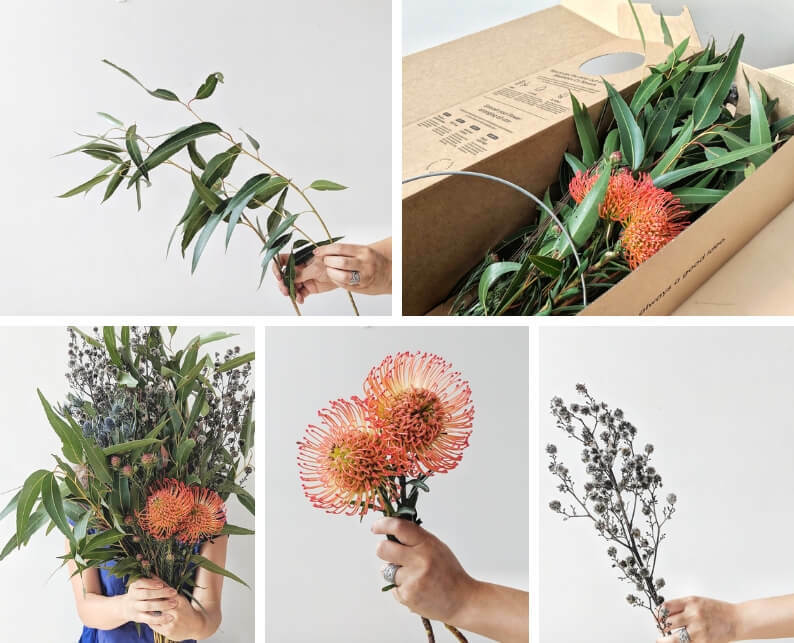 Silver Gum – A classic and oh so stylish foliage! It’s right on trend styled all on it’s own in a glass vase, but also provides a soft silvery backdrop in an arrangement or for a festive wreath. 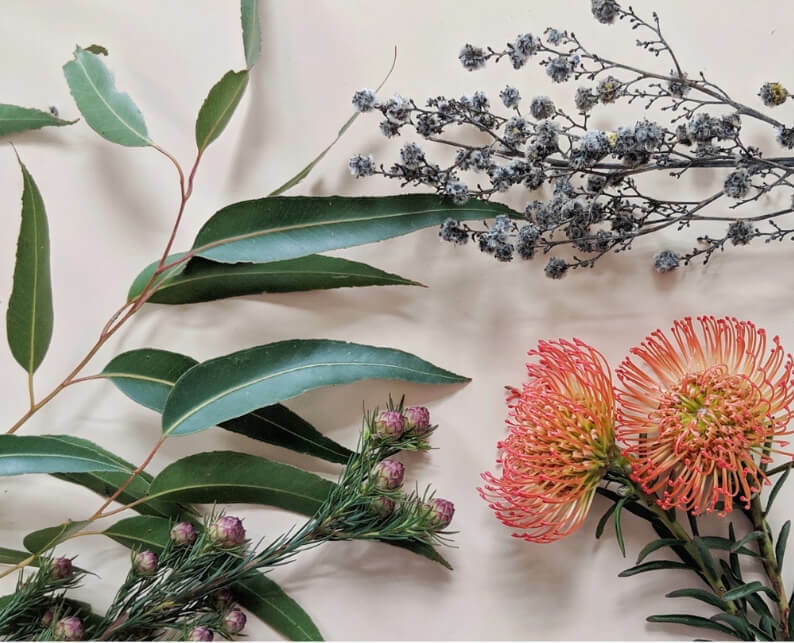 When your blooms are done, gather up and leftover eucalyptus and hang it in a bunch in your shower for a steamy fragrance that will last for weeks.